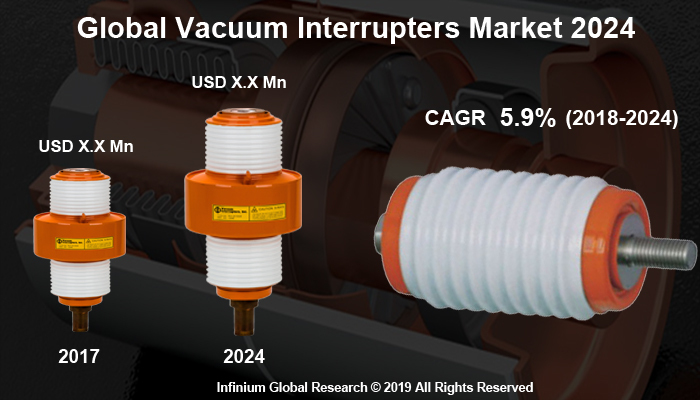 A recent report published by Infinium Global Research on vacuum interrupters market provides in-depth analysis of segments and sub-segments in the global as well as regional vacuum interrupters market. The study also highlights the impact of drivers, restraints, and macro indicators on the global and regional vacuum interrupters market over the short term as well as long term. The report is a comprehensive presentation of trends, forecast and dollar values of global vacuum interrupters market. According to the report, the global vacuum interrupters market is projected to grow at a CAGR of 5.9% over the forecast period of 2018-2024. Vacuum interrupters is a core component and used as a switch in electrical circuits. Vacuum interrupters used in a circuit breaker with different voltage levels along with a simplified arc quenching method. Benefits offered by vacuum interrupters are minimum maintenance, long life, environment-friendly, and most reliable current interruption technology. In vacuum circuit breakers, vacuum interrupters carry and interrupt normal as well as rated fault current. Vacuum interrupters are mostly used in applications that require medium voltage. Growing industrialization, as well as increasing power need, drives the growth of vacuum interrupters market. Rising adoption of vacuum interrupters in medium voltage applications boosts the growth of vacuum interrupters market. Furthermore, rapid urbanization as well as huge economic growth coupled with the increasing need for power distribution and transmission that in turn propel the growth of vacuum interrupters market. Moreover, increasing investment for replacement & refurbishment of aging infrastructure contributes to the growth of vacuum interrupters market. Increasing demand for fast switching devices in the power industry contributes to the growth of vacuum interrupters market. However, owing to transit damage or failure there are chances of loss of vacuum that in turn may hinder the growth of vacuum interrupters market. Moreover, growing power distribution network provides fruitful opportunities for vacuum interrupters market. Increasing investments in renewable energy and ongoing projects, as well as innovation in technologies that reduces the energy losses, provide beneficial opportunities for vacuum interrupters market. Geographically, Asia-Pacific dominated the vacuum interrupters market. Growing urbanization, as well as increasing demand to reduce power losses and rapid industrialization in the region, boosts the growth of vacuum interrupters market. Rising oil and gas plants and ongoing electricity transmission and distribution projects fuel the growth of vacuum interrupters market in the region. Furthermore, increasing investment in replacement of old infrastructure and research and development activities in the North America region particularly in the U.S provides beneficial opportunities for vacuum interrupters market. The increasing demand for vacuum interrupters in the utility sector in Europe contributes to the growth of vacuum interrupters market in the region. The report on global vacuum interrupters market covers segments such as contact structure, application, and end-user. On the basis of the contact structure, the sub-markets include flat contact, spiral contact, and axial magnetic / field contact. On the basis of application, the sub-markets include medium-voltage circuit-breakers, generator circuit-breakers, and high-voltage circuit-breakers. On the basis of end-user, the sub-markets include transportation sector, mining sector, oil & gas sector, utility sector, industrial plants, and others. The report provides profiles of the companies in the market such as Mitsubishi Electric Corporation, China Zhenhua Electronics Group Yuguang Electric Co., Ltd., Wuhan Feite Electric Co., Ltd., Chengdu Xuguang Electronics Co., Ltd., Meidensha Corporation, LSIS Co., Ltd., Avantha Group, ACTOM, Siemens AG, Eaton, and ABB. The report provides deep insights into the demand forecasts, market trends, and micro and macro indicators. In addition, this report provides insights into the factors that are driving and restraining the growth in this market. Moreover, The IGR-Growth Matrix analysis given in the report brings an insight into the investment areas that existing or new market players can consider. The report provides insights into the market using analytical tools such as Porter's five forces analysis and DRO analysis of vacuum interrupters market. Moreover, the study highlights current market trends and provides forecast from 2018-2024. We also have highlighted future trends in the market that will affect the demand during the forecast period. Moreover, the competitive analysis given in each regional market brings an insight into the market share of the leading players.